Four handbell choirs rehearse weekly and provide music for worship about once a month. Ringers of all ability levels are welcome to join us throughout the year. For more information, please contact Beth Ann Edwards (bethann@stjohnsdsm.org). Chamber orchestra, comprised of St. John’s members with Des Moines metro-area professional musicians grace our festival worship services throughout the year. A truly multi-generational expression, the Chamber Orchestra includes some of the finest area high school, collegiate, and professional musicians from the Central Iowa region. The Chamber Orchestra offers support to the Cathedral Choir in presentations of significant choral works alongside stand-alone sacred works composed for liturgical celebrations. Rehearsals are scheduled throughout the year prior to specific worship events. The Friends of the Arts at St. John’s provide stipends for four “String Scholars” for each program year, September through mid-May. Talented college and high school musicians are recommended by their teachers or orchestra directors and then auditioned. This string quartet (two violinists, one viola, and one cellist) then play in worship, accompany choral selections, liturgy, and hymns when called upon, and also form the core of larger ensembles. The “String Scholars” are not intended to replace other, student or adult volunteer musicians but to encourage and strengthen less experienced players. They also make possible more authentic performance of music from the past which would have been performed with strings, winds, brass and timpani rather than organ or piano thereby breaking down stereotypes of what “traditional” church music has been and adding variety and color to the 10 am worship music. 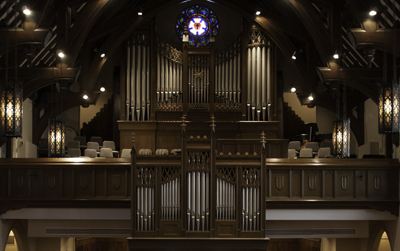 String Scholars, currently comprised of students from the Drake University music department, provide musical and artistic support to the worshipping community at St. John’s throughout the program year, September through May. This resident string quartet rehearses each Sunday morning and participates in worship once a month and for special services and concerts. Repertoire for this ensemble is drawn from classical sacred music and newly published compositions – hymn-based and freely composed works. Rehearsals take place on Sundays from 11:00 am – 12:00 pm. This group rehearses Sunday mornings at 10 am to prepare music for liturgies. It practices in the blower room behind the organ (hence the name), and it is led by professional musician and educator Joel Gettys. Additional trumpets, cornets, horns, trombones, euphonium, and tuba are welcome. Consist of versatile musicians who play keyboards, guitars, and percussion to accompany portions of the liturgy and psalms for which that style and sound is appropriate. Rehearsals are by agreement.